Welcome to 2015! Whether out and about or celebrating at home, I hope you all ushered in the new year with style. As everyone seemed to like last week’s film suggestions and we still have a few days off ahead, I am sharing a few New Year’s movies for weekend watching. I was surprised to discover that I had never written about one of my favorite classic films, Holiday. 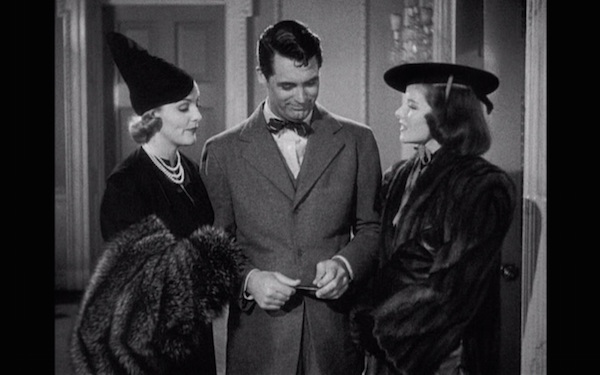 This 1938 George Cukor classic, starring Katharine Hepburn and Cary Grant, though not as well known as their other comedic collaborations, Philadelphia Story and Bringing Up Baby, is a winning romantic comedy with a great cast, witty repartee and mindful message, not to mention elegant wardrobe and fabulous setting. 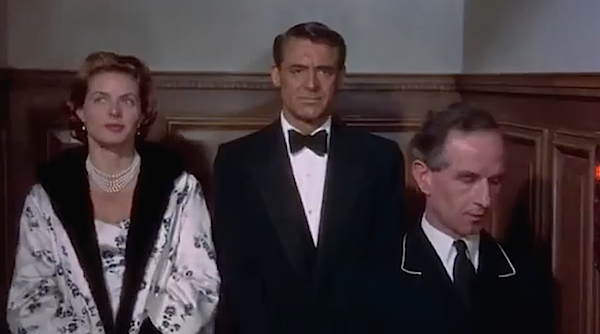 Cary Grant plays Johnny Case, a young self-made man on the rise, who falls in love with and proposes to the beautiful Julia Seton (Doris Nolan, above left) on vacation in Lake Placid. 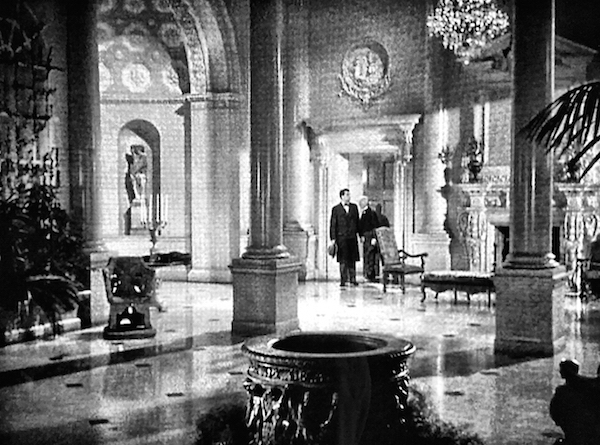 It isn’t until they’re back and he pays her a visit at their Fifth Avenue manse below (apologies for my grainy shots – the movie is quite crisp) that he learns she is a member of an illustrious banking family. Despite his nonconformist attitude toward his career and the value of wealth (which come as rather a surprise to Julia), he wins over her family, including free-spirited sister Linda (Katharine Hepburn) who relates to his refreshing ideals. 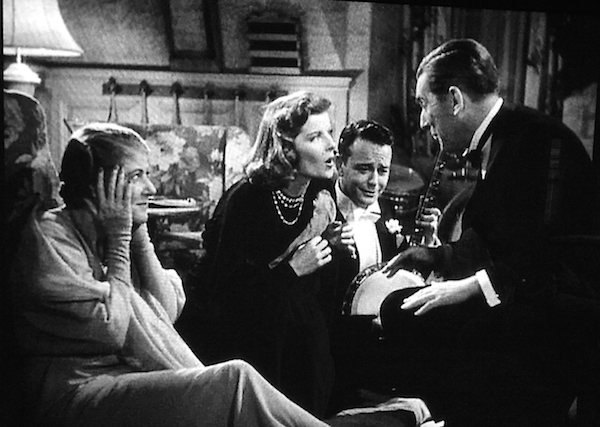 A fantastic supporting cast, below, includes Lew Ayres as the disillusioned yet wise alcoholic brother, who has some of the best one-liners in the film, and Jean Dixon and Edward Everett Horton (always a fave) as the witty and fun professor and wife who are Johnny’s best friends. This is a marvelous Cuckor classic that deserves to be better known. 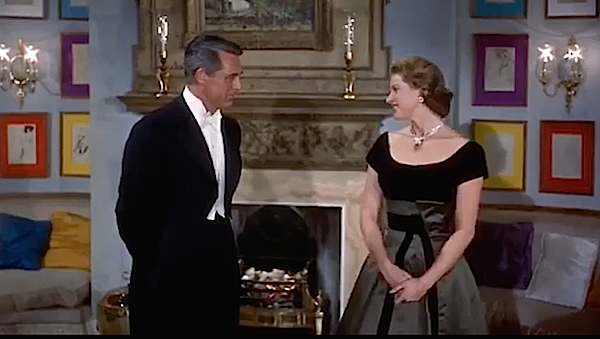 A more modern (1958) yet more mannered light romantic comedy with Cary Grant is Indiscreet. 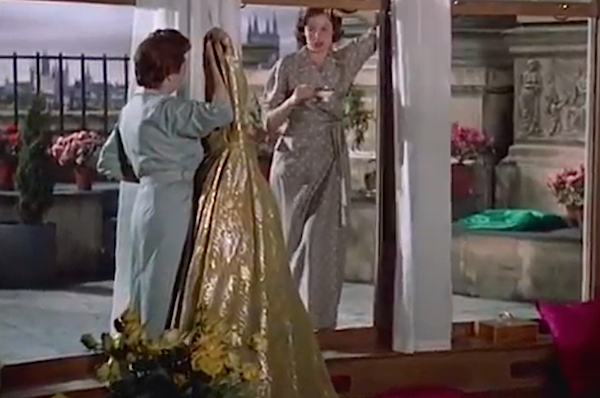 Ingrid Bergman plays London-based stage actress Anna Kalman who, while famous and accomplished, is on the verge of giving up on love. 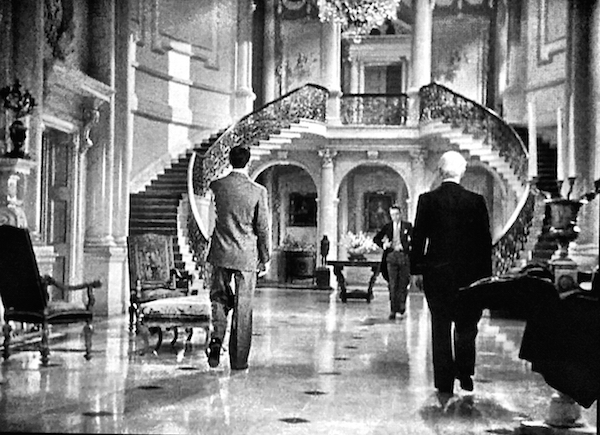 Enter Philip Adams (Cary Grant), a handsome financier/economist she meets through her diplomat brother-in-law. Of course romance ensues with witty dialogue, fun and plot-twisting complications. and this leopard coat divine. Her apartment is totally chic with just the right mix of antiques and contemporary touches, such as the colorful mats seen on the art below. And how about these marvelous large windows that open onto the terrace. While it may start a bit slowly, hang on for the laughs in the last half. Lastly is Frank Capra’s 1941 Meet John Doe, which I have reviewed once before, but since it was several years ago, I’m sure many of you haven’t seen. More serious than Capra’s mad cap comedies, the film stars Gary Cooper and Barbara Stanwyck in this allegorical film perfect for the holidays. Cooper delivers what probably would have been an Oscar winning performance were it not for his role that same year in Sergeant York for which he did win the Academy Award. Barbara Stanwyck is also terrific as the cynical professional woman whose ambition originally outweighs her morals. The film, made in 1941, has intentional anti-Nazi and Fascist undertones. It pits the political machine and manipulative media against the plight of the common man. This is a timeless theme as relevant today as it was then and certainly appropriate for this season as Capra espouses his belief in the basic goodness of man and the power of brotherly love. Even if it just serves as a reminder to do unto others, this film has a rousing feel-good ending that will reinforce your faith in mankind. This entry posted in At the Movies, holiday. 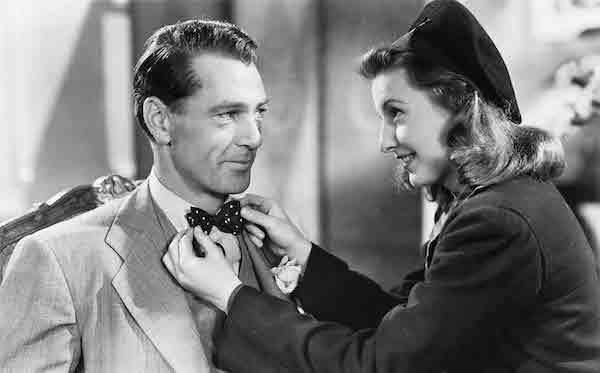 Entry Tags: Film, holiday, Holiday Movies, Indiscreet, Meet John Doe, Movies, New Years Movies Bookmark the permalink. Sheila – Holiday is available to watch on Vudu or Amazon instant streaming (available if you’re a prime member). Or you can get the DVD through Netflix or of course buy it at any number of outlets including Amazon. Happy New Year. And to think that I have never seen Holiday! How is that even possible? Merci beaucoup et encore, Bonne Année Stacey! I love Holiday, but have never seen the others…a few for weekend viewing. Enjoy your weekend, Stacey, and we wish you all the best in the new year. 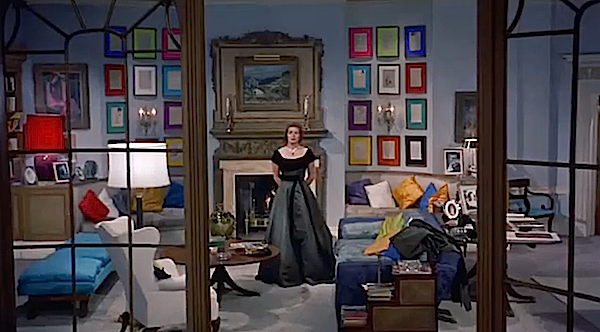 Indiscreet for the fashion and art is one of my favorites, I must see Holiday and meet John Doe now!! All favorites of mine! As a bonafide TCM fanatic, I can honestly say I was born in the wrong decade. 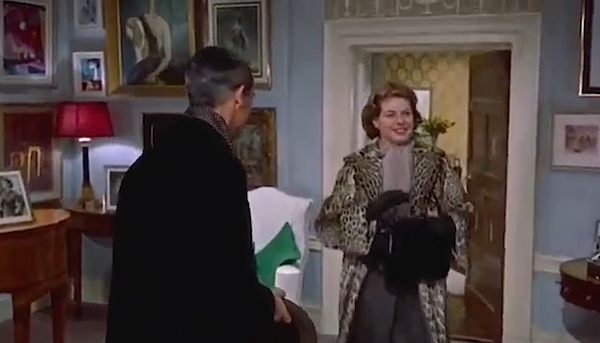 We just watched The Philadelphia Story last night, followed by To Catch A Thief. Fabulous! YAY! Another holiday wknd full of great movies. I watched four from your prior list and will head out to rent these. Now you know you’re setting a precedent here with these great films, don’t you? So please be sure to create a new list in another month or two. Thanks so much Stacey! Always appreciate movie recommendations. Happy New Year! How fantastic!! I watched Holiday the day after Christmas on demand. It was wonderful. I can’t wait to see the movie Indiscreet. That looks wonderful! I also just watched Anastasia with Ingrid. She was wonderful in that movie also! 83 queries in 0.523 seconds.